For today's Makeover Monday I am going to go over the second concept design for my office. This is for the wall located to the right of the last concept design. This is where the window is located which didn't leave us with a lot of options. 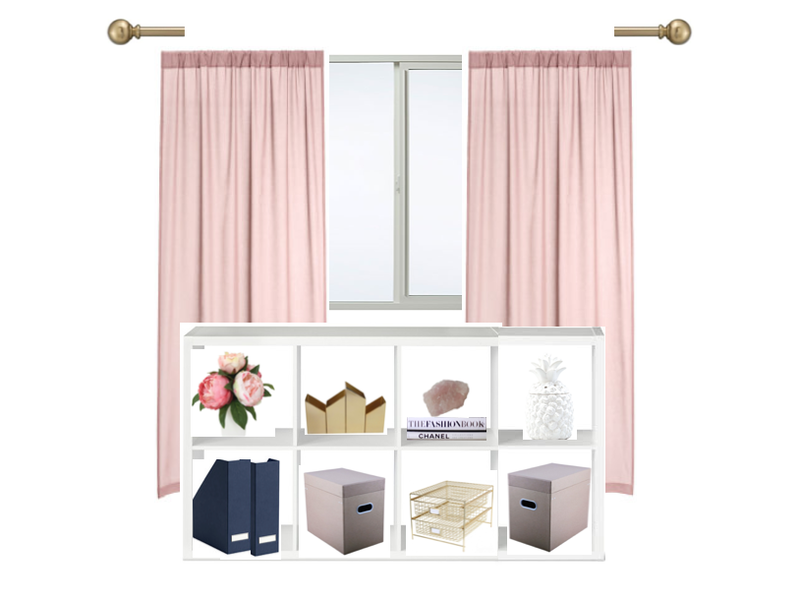 This eight cube organizer is the perfect size for under the window and adds much needed storage space. The bottom shelves hold larger organizational items. Magazine holders, file boxes and a drawer set. Above we have decorative items. Peonies in a vase, a gold pencil holder, a pink rock on top of decorative books and a white pineapple Scentsy. Behind the organizer long dusty pink curtains hang from a gold curtain rod. The navy, gold, black and white make the office feel more formal. While the the pink adds a pop of color and fun to the room. Do you like your creative space more fun or formal?